DataSunrise Database Protection Suite is a state-of-the-art protection system that keeps databases and sensitive data safe and protected even when databases and workload are moved to AWS. The Amazon DynamoDB Audit feature is a special tool for our customers using Amazon DynamoDB to be protected against any potential threats. Database Audit for Amazon DynamoDB from DataSunrise is a database activity monitoring feature that helps DB administrators and IT personnel of your company to take preventive measures against any threats from inside and outside, including hacker attacks. The Data auditing tool also a prerequisite to comply with national and international personal data protection legislation. Being active 24/7 it’s auditing all activity relating to your database. The results of auditing are saved to logs. Auditing of Amazon DynamoDB is carried out through sets of Rules which are easily adjustable, but still very effective. Notifications can be set to inform your personnel is case of malicious or just unusual actions: abuse of access rights, numerous queries to sensitive data, not to mention attempted SQL injections, etc. Learning Rules can be enabled for Amazon DynamoDB databases. Learning Rules make is easier and faster for your IT personnel to start effective database protection. Typical and safe queries are analyzed and whitelisted. This helps to sort them out from unusual and potentially dangerous queries. 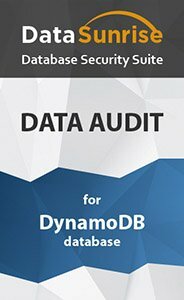 Audit tool from DataSunrise for Amazon DynamoDB can protect more than 30 types of sensitive and personal information. This information can include SSNs, medial and financial information, address, credit card numbers, etc. Four types of users can be assigned on DataSunrise. Each of them has certain access rights and privileges. Compliance Manager, which is another feature of DataSunrise Databse Protection Suite for Amazon DynamoDB helps to ensure that your company is compliant with national and international regulations and laws protecting personal sensitive information. The compliance process thanks to the Compliance Manager is highly automated. So, you can be sure to meet the requirement of HIPAA, PCI DSS, SOX, etc. Amazon DynamoDB Audit tool from DataSunrise is a highly adjustable and reliable instrument you can use to make sure that your databases are protected, even in the cloud.